If you read mmo-champion, this is basically a repost. If not, you need to check out this addon. Not because it's amazing (it is), but because raiding is about to become way less engaging (way more sleepwalky? how to engrish? pst) if this catches on like Gearscore has. AVR (Augmented Virtual Reality) allows you to draw (actually, 'place in 3D') circles and arrows, and basically scribble all over the play area like John Madden. You can use it before a pull to show people where to stand before a pull, or draw a fancy map that stays up during the fight itself. It even has its own Deadly Boss Mods style system that ties into boss abilities, and will draw big red circles on the ground where Festergut's globules are going to land, for example. On the player side, you can also run around with a circle in front of you, 5 yards out, as your 'I'm a mage, this is where I'll blink to' spot. At first it sounds neat, but then you realize this is even more of an excuse for people to not join Vent, and not socialize with one another. VENT FOR ICC HMS LOL? MIC IS BROKE, JUST DRAW GREEN CIRCLES FOR WHERE YOU WANT ME, AFK 2 PEE + SMOKE, BRB WHILE U SCRIBBLE KTHX. In the case of the mage blink spot, is it really that hard to see where you'll end up? isn't that part of learning how to blink in the first place? Back to bosses, I personally don't run DBM, and prefer to actually try and pay attention to the fight itself. It isn't horribly complicated, given how scripted encounters don't really change once you learn them. The only variable is something like 'fire will appear', but you don't know where. You certainly know WHEN it will appear if it's based on health percentages, and even though I don't run DBM, our raid leader does, and it's screaming out 'ENRAGE IN 25 SEC", or "MARK OF THE FALLEN CRUSADER ON NAWMANSORRY" over /rw, which alone is pretty disappointing. I can appreciate the beauty of the Addon, how much work must have gone into it, and how skilled the coder must have been to pull it off using tools that are available to him within the game's engine. Addons, as a rule, can't introduce any external elements, so everything in there is a function of the game itself. Whether or not Blizzard will 'break' this Addon remains to be seen. What do you guys think? Nice addition, or another excuse to not pay attention to the fight itself? I'm torn! 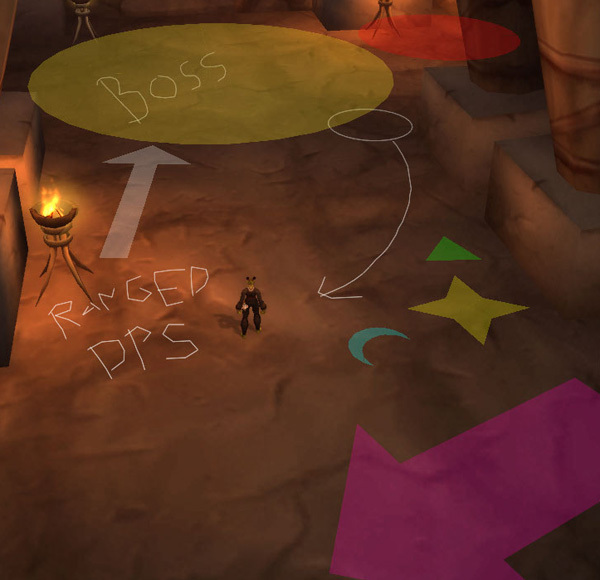 As a raid leader, I would *love* to be able to draw on everyone's screen to help explain fights. But it also kind of ruins raiding. No need to talk, little need to pay attention, and totally breaking the already-shakysuspension of disbelief. You could stop making character models and texturing the walls, and just make the raid environment itself a bunch of circles and arrows and dots. Instead of "spell incoming I have to move over out of its range" it's "a raid warning just popped up telling me to run to the green circle." But I'm not even that sure if that's much different from current raiding. Thus, torn. More thought is needed. I'm not going to get used to it until we know that Blizz isn't going to just disable it in the next patch. I definitely recommend spending 5 minutes with it before it does get broken (if it will), as it is really amazing. beings up the UI, and then you can create a new 'scene' (scroll down to find the arrow tool, etc). Once drawn, you can "broadcast" the scene to anyone else with the addon (using custom chat channels). I wonder how permissions work, or if I could just draw dicks on the ground during LK attempts...? It sounds great as a pre-fight tool. If I were Blizzard though, I'd break it by wiping the screen during combat. 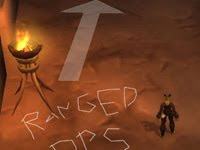 Draw all your arrows and circles and map it all out, but no letting addons dictate every single action every second. I was pretty surprised when I first heard about this, I have nothing but respect for the person who coded it. I wanted a mod like this years ago, but I was always under the impression that it was impossible -- that you could draw on the screen as much as you like, but the 3D environment was off limits. I can't see this addon staying around for very long at all. I would actually prefer if that addon had allowed you to plan out a strat but not while you're trying execute it. I feel part of the fun in raiding is mastering the strat. Otherwise I would just feel like a puppet - go here, now go here, etc. I'm all for helpful addons like DBM, etc but I think AVR is taking it a hair too far. When I remember the Sindrigosa encounter (it was a last fight that my guild did before it basically started wasting away, which it has), I think about this baddon. And how it would have made Ice Block placement in p2 & 3 easy peasy. In a complicated fight, it would have simplified things, and stopped like 40 wipes. It probably wouldn't have saved the guild, but eh. I'm sure others can think of great uses for it. I do think it's useful for certain encounters where intense training of complex strategies is the key. More training = more success, and this is the equivalent of the guy in the wookie suit for actors. They can imagine that the person is a real wookie, instead of some person saying, 'Ok, there's this big 7 foot tall furry guy in front of you, start acting'. In the end, think of the cool stuff you can do with it, and do it while you still can. That's... pretty durn cool. Sure, it can make things more mindless, but man, that's some sweet programming going on there. I'll second the idea of turning it off during combat. Let leaders teach with it, but keep it from being a huge crutch to actually playing. Then again, if I were the coder, I'd have put those in as options in separate modules so Blizzard could break the part they don't like. Yeah, you really do have to turn it off in combat. But seriously, imagine if more raid leaders used this as a teaching aid. Complex training done quicker. Definitely something Blizz should keep. That they haven't already responded shows that, yes, they probably do think it's a bit unbalanced, but they want to see what people think, and will probably allow it to stick in some way.